Not everything is pristine. In fact, very little is. As an example of the thought in the title, take these two pink evening primrose flowers, Oenothera speciosa, that I photographed near Yaupon Dr. in my extended neighborhood on April 1st. If that’s too bedraggled for your taste, I’ll relent and balance it with a picture of a pink evening primrose flower that remained mostly pristine even in the stiff breeze on the Blackland Prairie in Round Rock seven days later. So windy was it that I set the camera’s shutter at 1/800 of a second in hopes of stopping the flower’s movements. You’ll recognize that the background color comes from the colony of bluebonnets, Lupinus texensis, that the pink evening primrose had managed to find a roothold in. I often find beauty in the bedraggled or even death. But I must say that bluebonnet background is spectacular in that second image! 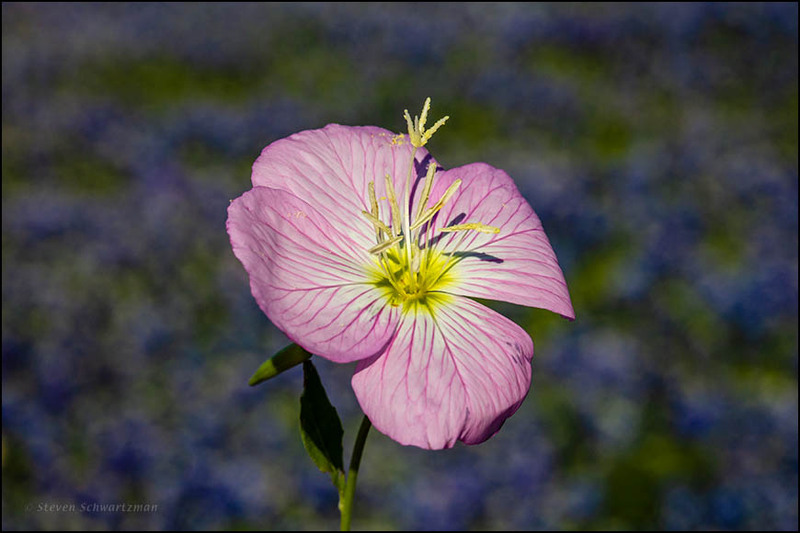 We have pink evening primrose here on the place – such a delicate wild beauty. Yes, individual pink evening primrose flowers don’t usually make it past one day. Fortunately, replacement flowers readily appear during the plant’s bloom period. Maybe baseball teams should put 1/800th between second base and third base. The first photo, with its unusual range of colors and that marvelous striped sheath, is just wonderful. I’ve never seen pink, salmon, and lavender combined in a single fading primrose, and I’m going to be looking a little more closely. I had to smile for another reason. I’ve been collecting images of flowers that I’ve named “nibbled1,” “nibbled2,” and so on. They’re not pristine, either, but for a different reason which I’m sure you can imagine. The second primrose appears to be standing a little taller than most I see. Perhaps mowing makes the difference. I know that in places where regular mowing takes place, the re-emerging primrose often bloom only an inch or two above the ground. Of course, it could be that the photographer was only an inch or two above the ground. I’m with you in finding the sheaths of pink evening primroses fascinating. Likewise for the unrolling buds. I’ve sometimes wondered why photographers don’t more often focus (figuratively and literally) on those two features. Speaking of nibbled, some species seem more susceptible to that than others. I’ve noticed that about the leaves of Turk’s cap, and someone else in Austin once made a similar comment about rarely seeing one without nibbled leaves. I don’t know how often the property in Round Rock gets mowed, but I suspect pretty often, given that it’s adjacent to businesses. I did lie on the ground for the pictures I took of foxglove on that property, but I was more upright for the picture of the pink evening primrose. Excellent! Love the second one with creamy bokeh!!! My favourite painter Andrew Wyeth famously said/wrote: “I prefer winter and fall, when you feel the bone structure in the landscape – the loneliness of it – the dead feeling of winter. Something waits beneath it; the whole story doesn’t show. I think anything like that – which is contemplative, silent, shows a person alone – people always feel is sad. Is it because we’ve lost the art of being alone?” I love the first photograph of Primrose. There’s something hidden and lovely in those folds. What thoughtful comments from Wyeth and from you. While we don’t have much of a winter this far south, some springtime plants leave dry remains that last through the summer and the following winter and often even into the next year. As a result, it’s the dead stages of those species that nature photographs here most often have to work with. The pink evening primrose isn’t in that long-enduring group—what you see in the first picture was soon gone—but the ephemeral decaying forms are just as worthy of a look. In this case they’re sculptural, as you noted about the folds. I’m not surprised that as a painter you appreciate them. 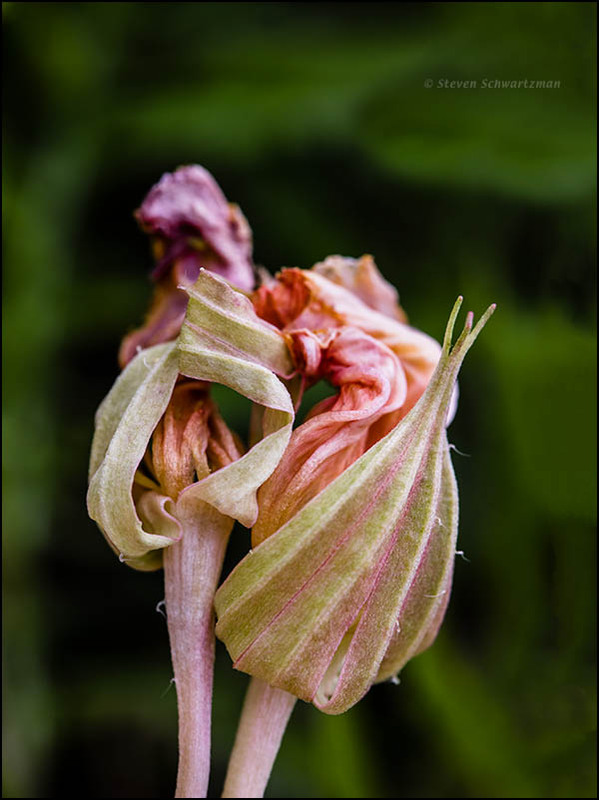 They are both lovely images; the first reminds me of a study I did of a dried brugmansia blossom (pink, so it was ‘dirty pink.’ The second – wow – especially with the carpet of blue ‘chochos’ in the background! Thanks for one more peek at those lovely blues! You’re welcome for the peek. As someone who started out saying that this hasn’t been a good year for bluebonnets, I’ve been gainsaying myself with later-gathered evidence to the contrary—and still more bluebonnets will be coming your way. Did you post your study of a dried brugmansia blossom? If so, maybe you can give us a link to it. Buenos dias! It will be great to see more vistas of bluebonnets. Yesterday I enjoyed a chocho/aguacate/tomate salad… very nice and colorful! Last night I was scrolling through old ‘art’ images on the computer and saw that dried study. I’ll upload it now and will be back soon to share the link! Your chocho is unusual in being edible. From what I’ve read, many Lupinus species contain chemicals that are harmful to humans if ingested. I suspect the long washing that chocho requires is to remove any residual chemicals that taste bad or are bad for you. Looking forward to your link. the internet became so weak that it stopped working.. i suppose that’s true of all of us – we need down time! will be heading home today, a 7-hour drive, though presently the sun is shining, and i hope it’s smiles all the way to the other end of this journey! Thanks for the link. Your wilted subject sure was long; mine collapsed on themselves. May you have an uneventful 7-hour drive. The first image is absolutely exquisite, Steve. The backdrop of the primrose is a gem. As you must know, Dina, not many people are drawn to flowers at the stage shown in the first photograph. I’m pleased to find that you and Lisa Brunetti are. As for the second image: so many species of wildflowers grow natively in my area that I enjoy playing one off against another. Sometimes they have equal prominence. At other times, as here, one serves as a background for the other. I love your work, Steve. There’s so much to learn from you. Welcome. I’m still learning, too. Then welcome to the club of dying-flower appreciators. We have a select membership. I quite like to see flowers in their twisted shriveled stage as well as fresh and new. In fact some botanist friends of mine and I enjoy forensic botanizing. Both of these images are very nice. I like your term for it: forensic botanizing. Glad you like both pictures. To get the second photo I took many, given how briskly the breeze was blowing and how uncertain I was about which pictures would come out decently. Yes, I can just picture how that would have been, the flower bobbing sideways just as you have a bead on it. And various petals kept blowing in front of the stamens and pistil.